Very good thing! Should be like that in every restaurant/brasserie etc.! 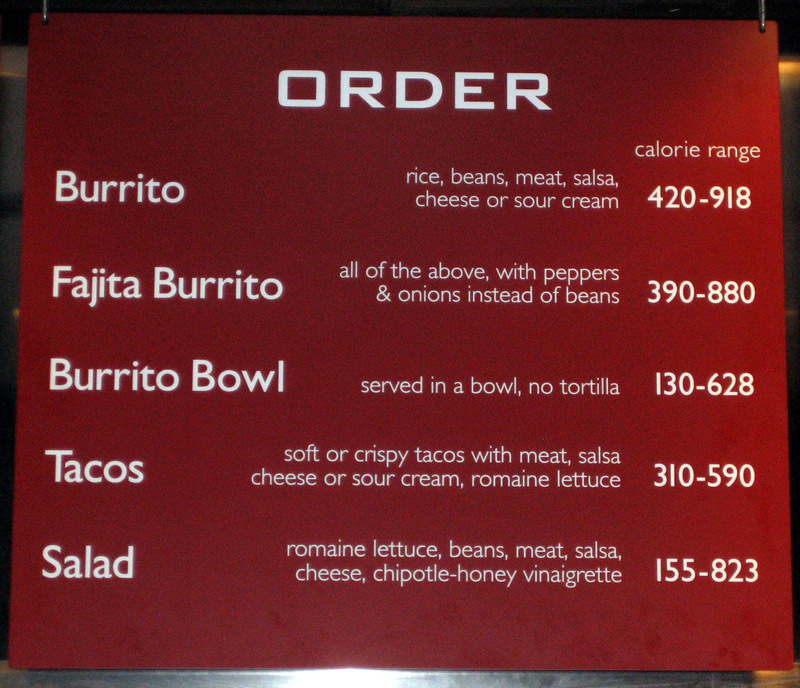 Thanks to the people that directed me to more images of menus with calories. As a New York native, I’ve been seein’ calorie indicators about a month or so before this took place. I walked into a Dunkin’ Donuts a couple weeks back, wanting to take comfort in coffee and a bit of muffins, when lo and behold! The calories of each muffin were placed, conspicuously, under the name of the muffin. Needless to say, I haven’t got a muffin from there since. 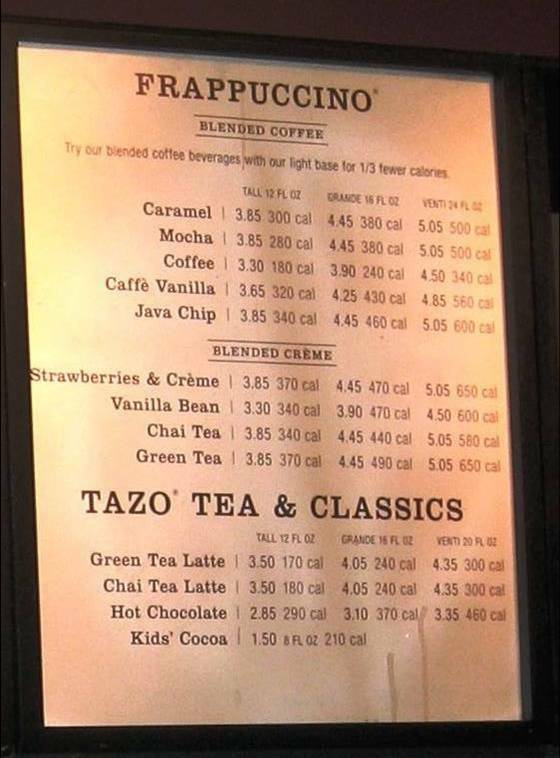 And Starbucks is making me reconsider some really yummy caffeinated beverages with the calories displayed next to each drink. If you’re not having those calories, I’ll give them a good home! … that fat guy over there. dovalia – It’s doing the designed purpose. I am eager to see the trend spread. 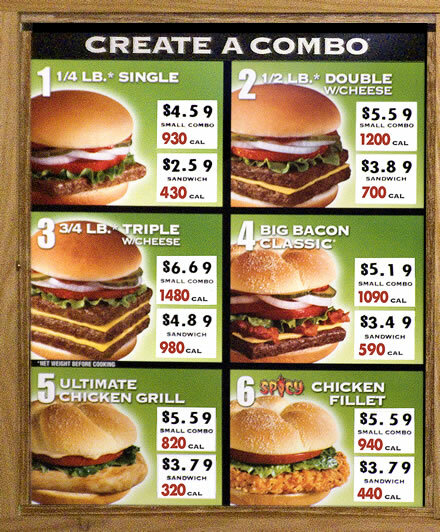 I have a feeling some restaurants will modify their 1000+ calorie items down to triple digits. We’ll see though. Los Angeles City Council OK’s a one-year ban on new fast-food restaurants in South L.A.
I’m not really for the ban on new fast-food restaurants. The only reason they exist is because of demand and well… people are willing to eat it. The companies have done nothing wrong, they simply offer a service. In my opinion it is up to to consumer to decide whether they use the service. Just banning restaurants isn’t going to teach consumers anything. To me education about nutrition and diet is the critical. As I said in my own rant…it’s about personal accountability. If you read those signs with calories posted, it’s not enough. You have to be willing to DO something with the information because you’re not going to burn off those calories just by reading a darned sign. I think it’s a very interesting law but I don’t believe it will change anything, it may have a short term impact but after a few months everybody will be back to their old habits. In my opinion, who will benefit from this law are the restaurants because they will not be accountable for anything because they will say that the amount of calories were display on the menu. 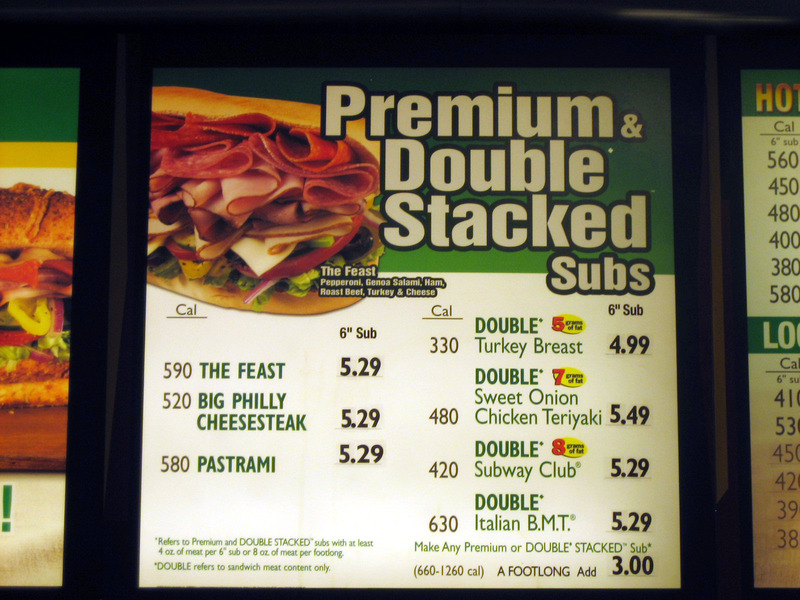 However, if in your menu you have a sandwich that has 980 calories you should be accountable for something. This might be an off chance but I am hoping that sales of high calorie items drop, forcing restaurants to provide healthier alternatives. Just hoping! Have you ever thought about writing an ebook or guest authoring on other blogs? I have a blog centered on the same ideas you discuss and would love to have you share some stories/information. I know my visitors would enjoy your work. If you’re even remotely interested, feel free to shoot me an email.